The township of Ti Tree serves many Aboriginal communities in outlying areas and is home to the Anmatjere people. The roadhouse caters for most travellers needs including a small shop, caravan park and campground. A visit to the Red Sands Gallery is a must. 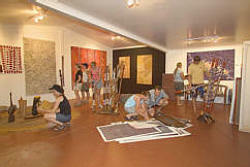 The gallery is one of the best in Central Australia featuring artwork from the renowned Utopia region to the east. Don’t pass by. Stop and visit. They also make a very good coffee. The landscape between Alice Springs and Ti Tree is creatively spotted with granite outcrops, relating to the geological history of the area dating over 1,800 million years. Imagine the turbulence that sent these ancient boulders bursting out of the earth. A famous landmark just to the north of Ti Tree is Central Mount Stuart. Stop and check the Information Shelter on the Stuart Highway to learn more about this area.